Ace Cloud Hosting Can Pave the Path of Success for Your Accounting Team! The accounting industry today is very different from what it was ten years ago. Many new technologies are evolving. Cloud accounting is becoming more prevalent, and accountants have adapted to this mode of operation. While these transformations are creating numerous opportunities for accountants, there would also be some challenges to face this level of change. Whether your company is prepared or not, you will certainly be affected by cloud accounting and understanding all your options is half the battle won. The cloud provider you choose for your accounting team would influence your business’ growth. Therefore, it’s important to go for an experienced and trustworthy cloud provider that can meet your standards and requirements. So, to help you take the right decision, we’ve come up with the top five reasons why Ace Cloud Hosting should be your first choice to host your accounting software on the cloud. Pricing structure offered by the cloud provider plays a vital role in reaching a decision. While comparing the price structure of all service providers isn’t easy, it can help make the right choice. When your accounting software is hosted with Ace Cloud Hosting, you don’t need to spend money on purchasing and maintaining equipment. Also, there would be no need to spend on infrastructure, facilities, hardware, or even IT staff as you can enjoy the expertise of our skilled staff. With our flexible and transparent pricing structure, you’ll never be surprised by any hidden costs. 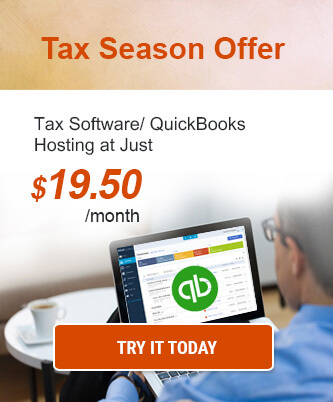 You would be charged based on the number of users using the accounting software and the server resources. One of the prime concerns among accounting firms is the security issues on the cloud. Any case of identity theft or stolen data can affect the operations of the company. 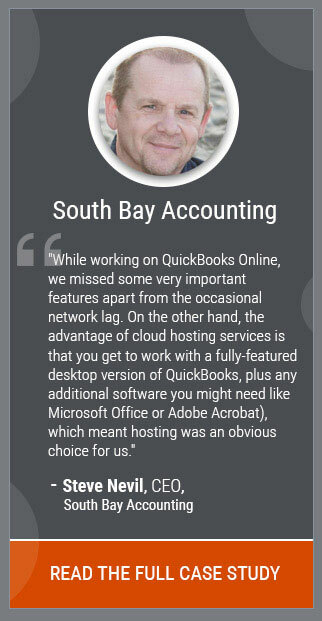 Hosting your accounting software on the cloud is safer as compared to the traditional method. In fact, 94% of SMBs have experienced security benefits in the cloud which were not available with their on-premise service. Easy accessibility of your accounting data is one of the factors which plays an essential role in the success of a business. Unfortunately, there will always be a few things which are not in your control. For instance, a small downtime may lead to serious repercussions for your business. Along with these features, we, at Ace Cloud Hosting, also implement Business Continuity and Disaster Recovery (BCDR) plans and 100-day data backup to make sure that your data is recovered in case of any unfortunate event. With an increased number of users working on the same accounting software, there is a need for watertight control of data. If multiple users are working on the same file, they need to send files back and forth as email attachments. This increases the chances of errors and mistakes. According to research by Vanson Bourne, companies that adopted cloud technology experienced a 20.66% average improvement in their business operations, 15.07% reduction in their IT costs, and 18.80% increase in efficiency of processes. With Ace Cloud Hosting, all your accounting data and files are stored centrally, and there would be only one version to work on. With remote accessibility features, employees can access, edit, download, upload, and share the data from anywhere and at any time. Users can log in from any device using a browser and get instant access to their data. With an improved collaboration in the cloud, you get better results and increased productivity. Therefore, if your accounting firm is still relying on the traditional methods, maybe it’s time to be more streamlined. 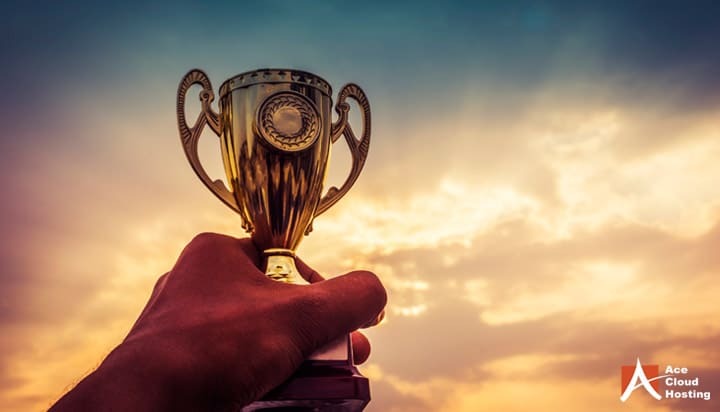 According to a recent study by IT industry association CompTIA, even though most companies are worried about the security in the cloud, only a few companies perform a comprehensive review of their cloud providers before reaching a decision. However, that is a mistake. There are a number of cloud service providers in the market with attractive offers. However, before falling for such deals and offers, one should always check their reputation in the market. See how they are being rated and what their existing or past clients have to say. Usually, a firm tends to put information which is beneficial for their business. 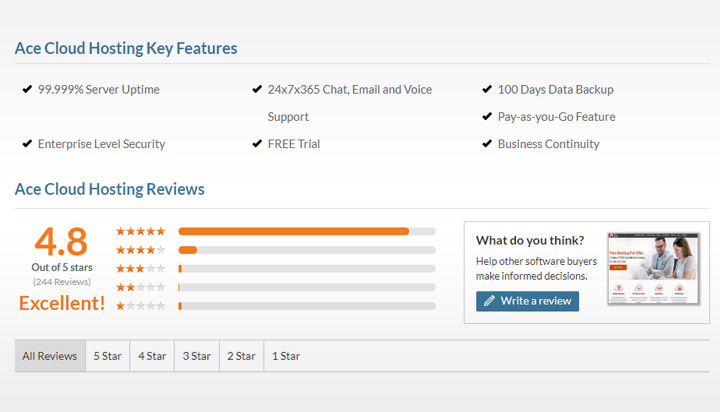 Checking our reviews on third-party websites is the best option to see how they are doing. Many independent rating platforms such as Serchen and Google reviews can help you reach a decision in selecting the best accounting software cloud provider. Opinions on these websites are based on user experience and thorough analysis. You can check Ace Cloud Hosting’s review on Serchen and decide for yourself. It is worth paying for a good service provider which can save you from headaches later. With the emergence of cloud accounting, several cloud service providers have emerged in the market. Because of the increasing competition, the providers are looking up the game by constantly adding new features and improving their services. With features mentioned above, hosting your accounting software with Ace Cloud Hosting would help to keep your accounting processes pacing with convenience. Not currently an Ace Cloud Hosting user and interested in experiencing these features? Sign up for a 10-day free trial and see how our services can help increase your business’ productivity.